The Calapooia River near Crawfordsville. Source: Wikimedia Commons. The Forest Service is proposing to mechanically push over at least thirty perfectly healthy and very tall and very large old-growth Douglas-fir trees into the uppermost Calapooia River, in the name of steelhead habitat enhancement. So-called tree-tipping is purported by some fish biologists to be helpful and by other experts to be harmful—or at best to be a distraction from getting the real restoration work done. At the end of this post, you are offered an opportunity to share your views on the proposal with the Forest Service official in charge. 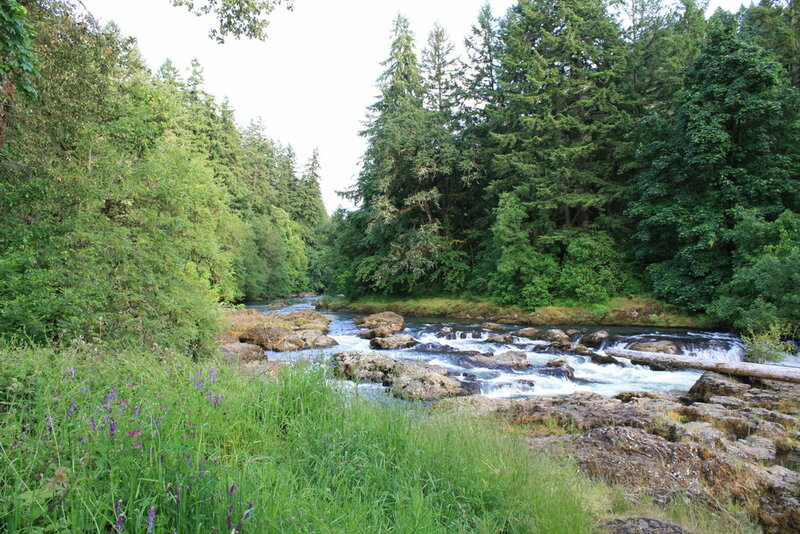 The Calapooia River starts in the Cascades north of Eugene and flows generally northwest to Albany, where it empties into the Willamette River. The Calapooia was named for the Kalapuya peoples, a conglomeration of eight Native American ethnic groups with three mutually unintelligible dialects that occupied the entire Willamette Valley before being essentially wiped out by the European invasion (ca. 1846–79). Descendants are now members of the Confederated Tribes of either the Siletz or Grande Ronde reservations. Upper Willamette spring chinook. Source: NOAA Fisheries. Of the eleven major tributaries of the Willamette River that carry the name “River” (not including the forks of the Willamette), I daresay the Calapooia is the least known (although also in the running is the Pudding River). Only 6 percent of the 366-square-mile Calapooia watershed is publicly owned—8,723 acres of Bureau of Land Management (BLM) holdings and 5,909 acres of Forest Service lands. The BLM lands are scattered in the middle watershed, while the national forest lands are the headwaters of the mainstem Calapooia. Though there are many contenders, the Calapooia watershed in western Oregon is among the most hydrologically hammered. Pity the poor salmon or steelhead returning to the upper Calapooia to spawn. After entering the Columbia River, it must travel upstream 101 miles and take a right into the Willamette River. From there to the mouth of the Calapooia is another 120 miles. Fighting its way through a Superfund pollution site, then through downtown Portland and clearing Willamette Falls, the fish continues up a river polluted by runoff, both urban and agricultural. Entering the Calapooia, the salmonid swims upstream through a region of intense agriculture and through the cities of Albany and Brownsville and the small communities of Crawfordville and Holley. Above Holley, the fish runs the gauntlet that is Weyerhaeuser’s Calapooia Tree Farm. Finally, near the mouth of United States Creek, our salmonid—if it is a winter steelhead (spring chinook no longer make it farther than the mouth of the North Fork Calapooia River)—enters the Willamette National Forest, a relative fish heaven considering the fish hell downstream. The Upper Calapooia Steelhead Enhancement Project of the USDA Forest Service, which proposes to “improve” fish habitat on the uppermost Calapooia River by pushing over very large and very old trees. Source: USDA Forest Service. An alarmingly small number of spring Chinook salmon now spawn here. In 1800, approximately 300,000 spring Chinook returned to the Upper Willamette basin. By 1940, only 40,000 spring Chinook returned each year. By 2008 the number had declined to less than 5,000 wild spring Chinook. Although in better shape, the winter steelhead population is also now at risk. The run has declined from 25,000 historically to about 5,000 today. Upper Willamette winter steelhead. Source: NOAA Fisheries. Decades of human activities have hurt the fish. Salmon and steelhead are vulnerable to a variety of threats, from those in headwater streams to the open ocean. Today, the three largest threats to Upper Willamette River salmon and steelhead are hydropower/flood control, habitat alteration and competition with hatchery fish. Additionally, climate change, disease, predation and past overfishing play a role. . . . The Calapooia River system once provided highly complex habitat conditions for salmon and steelhead populations. The river system responded quickly to changes in runoff during the seasons. Streamflows swelled with snowmelt and rainwater, and then spread across the flat lower floodplain through a system of meandering, interconnected channels. The high flows fed wetlands and riparian areas. Mature forests buffered the river system and covered much of the upper watershed. The trees contributed large quantities of wood to stream channels, forming pools and creating hiding and feeding cover for adult and juvenile fish. Braided channels in the lower watershed provided quiet backwaters, alcoves and side channels for fish. Riparian vegetation shaded streams and kept water cool for fish production. Changes in the Calapooia watershed greatly affect salmon and steelhead today. Many historical grass prairies, oak woodlands, wetlands, and riparian forests were converted for land use, especially to farmland. Stream habitat was modified, leading to the loss of deep pools and large wood from the channels. Several dams built on the Calapooia are being removed, but other artificial barriers still restrict fish migration. In the upper Calapooia watershed, the basic problem for salmonids is that the forest has been logged to crap (an informal term of art meaning that the hillsides and streamsides were stripped of their native old-growth trees and replaced with monoculture plantations). Weyerhaeuser’s Calapooia Tree Farm was stripped of its old growth around the turn of the last century and has been repeatedly and intensively logged since then. A significant amount of the uppermost watershed on the Willamette National Forest was clear-cut and converted to monoculture Douglas-fir plantations now forty to sixty years old. CWD is a more encompassing and less prejudicial term than LWD (large woody debris), a term still used by many foresters. On Forest Service lands, CWD is often in short supply, but it is in great abundance compared to the downstream Weyerhaeuser “forest” lands, where any CWD is an incidental relic that escaped commercial extraction because it wasn’t profitable at the time. Is Tree Tipping Really the Solution? Yes, there is a problem with the lack of CWD in streams, but does it make sense to push over perfectly fine old-growth trees in critical habitat for the ESA-protected northern spotted owl to aid the ESA-protected Upper Willamette spring chinook and winter steelhead stocks? The argument in favor of tree tipping goes that it is necessary and desirable to artificially advance the recruitment of CWD into streams to help fish populations. CWD is needed now, and we cannot wait until the trees naturally fall into the stream. Lee E. Benda, S. E. Litschert, Gordon Reeves, and Robert Pabst published a paper on tree tipping in 2015 in the Journal of Forestry Researchentitled “Thinning and In-Stream Wood Recruitment in Riparian Second Growth Forests in Coastal Oregon and the Use of Buffers and Tree Tipping as Mitigation.” (If you don’t want to pay $40 for a copy, request one from the lead author—leebenda@terrainworks.com). Also opposing the old-growth tree tipping is Kirk Schroeder, now retired from the Oregon Department of Fish and Wildlife, where he headed their Willamette Basin Chinook Project. Schroeder asked the Forest Service: “Please, leave the big old native giants and bring in some large roots and boles from another upland area to recruit instream habitat for salmon.” Such has been done with success on the Siuslaw National Forest. The Benda et al. paper modeled streams that have monoculture plantations to the stream’s edge. The uppermost Calapooia on federal public lands isn’t among them. Yes, there are monoculture plantations of relatively small trees near the Calapooia, but the proposal is to push large old-growth trees into the stream. Old-growth trees are not found in plantations. Also, the model used in the paper assumes that when they do naturally fall, trees fall in random directions. In fact, most trees near a stream will eventually fall into a stream. The trees the Forest Service has marked for mugging are approximately 4 to more than 6 feet in diameter at breast height and more than 200 feet tall. During high water, the Calapooia in this stretch is 30 to 40 feet wide. Please send a brief email to Forest Service District Hydrologist/Fisheries Project Team Leader Lance Gatchell (lgatchell@fs.fed.us) sharing your views in re to tipping over standing old-growth trees. I would also copy the Calapooia Watershed Council (operations@calapooia.org). Time is of the essence, as the end of the public comment period is a few days from today. Do not delay! Here’s what I sent, which can serve as a guide. I strongly oppose the Forest Service intentionally pushing over perfectly fine old-growth trees in the name of improving salmonid habitat—most especially within designated critical habitat for the ESA-protected northern spotted owl. While tree tipping may have some benefit in the short term in thinned plantations, it comes at the expense of long-term habitat quality. It is best to let nature drop large trees into the streams at her own pace. The first principle of ecological restoration is to stop irritating the ecosystem. The time of the Forest Service would be better spent by facilitating the massive re-establishment of beavers in the upper Calapooia watershed.